I have a very good and old friend who lives in Eastbourne. 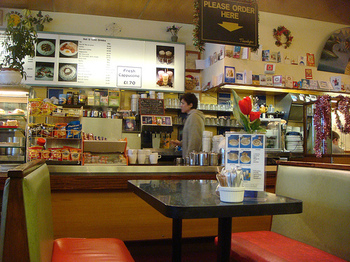 Every time we've visited I've asked if there are any interesting cafes in town and he's always said 'no'. And then, on the last visit I stumbled past this place, and a couple more. And he said he'd just forgotten about them. 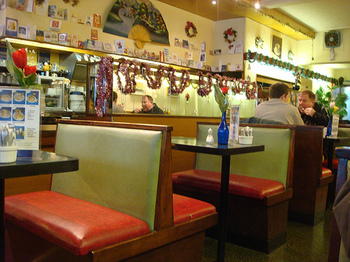 And that, to some extent is the genius and the curse of a great old cafe. They're part of the civic furniture and they're easy to forget until they're gone. Now, obviously that's a high quality cup of tea. Murky and lovely. You might say murkly. 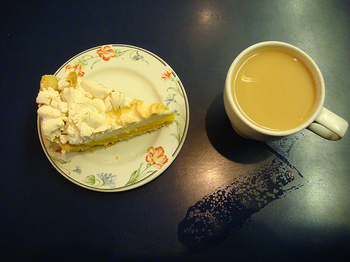 But look next to it - lemon meringue pie. OMG. You can't beat that can you. Oh no. 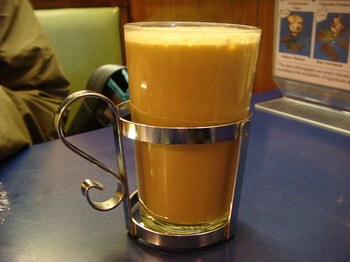 And you might even be tempted by a coffee, because you get it in one of these lovely cups with the glass and the metal and the handle. I love these things. 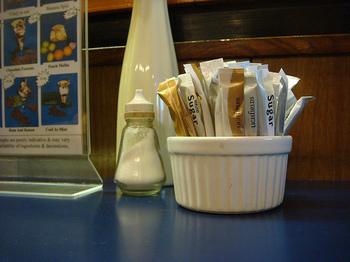 That sugar bowl's somehow like a flower arrangment isn't it? But the killer thing about this place is how fantastic it looks. 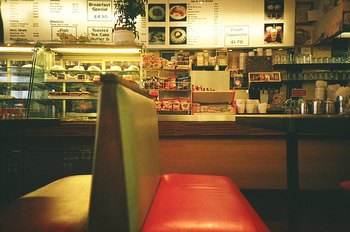 The splendidly cluttered and full cafe aesthetics. You could sit here for hours and always have something new and interesting to look at. 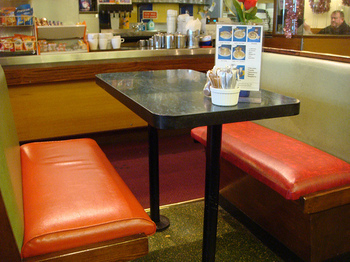 The booths are especially gorgeous, look at those colours, that upholstery. I can imagine posh designers trying for years to try and get that combination of colours right. 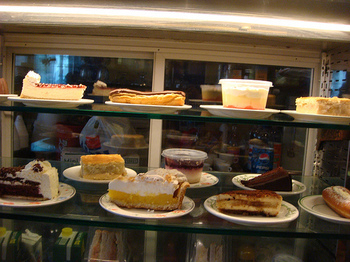 Cakes in a case. You cannot beat cakes in a case. A splendid place. 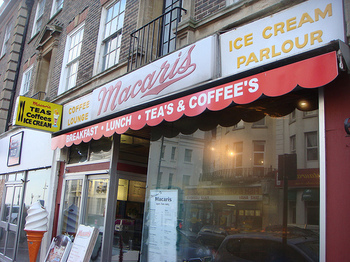 People Of Eastbourne - remember Macari's. It's right there. Frequent it frequently. You didn't mention the plate for the lemon meringue pie. But perhaps flowery plates are a girl thing. but I think that that 'tea' and 'coffee' are some kind of instant orange or mango juice. They look like it on my PC.